Lady Derring Takes A Lover by Julie Anne Long is a five dish read for me. I can’t say enough about this book and, truth to tell, I am writing this review with a smile on my face. It’s the same smile I had while reading the book. 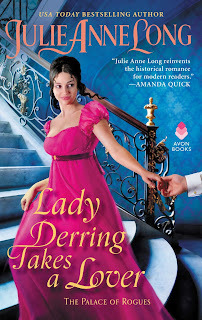 Lady Derring Takes A Lover is the first book of Ms. Long’s newest The Palace of Rogues series. Coming off the wildly popular and successful Pennyroyal series and her Hellcat Canyon series, you gotta wonder if a new book can stand up to muster. The answer is a resounding YES! This book is chock full of unique personalities, witty dialog and an interesting mystery or two. Lady Delilah Derring, a proper wife and daughter who knew her place in the world and what to do there finds herself a destitute widow thanks to her slightly neglectful husband with a penchant for statuary and cigars. The only bonus from his demise is the loss of those hideous statues, along with everything unentailed from larder to attic, except for the only thing he owned outright - a building on the docks. That was a surprise. Her second surprise came when Derring’s mistress, Mrs. Angelique Breedlove, barged in to see what pittance he had left her. As it turns out Derring, never generous in life, was equally so in death. Left destitute as well, she strongly advises Lady Derring to sew what jewels she may have into her clothes and leave the bare bones of her life and get away as fast as she can. Lady Derring is astounded that Derring seemed to owe everyone but managed to secure a building and mistress. That seals it for her. No more the meek and mild one, Delilah takes her endearingly inept maid and goes to the docks to see about this building she now owns. Gently bred or not, whatever it holds is her future now. She ventures into the pub next door and finds Mrs. Breedlove in the back contemplating her own future which includes stones in her pockets and a walk into the Thames. Angelique went from innocent miss to a misled venture into ruin to becoming a mistress to Derring. Delilah convinces her to put whatever jewels she has into her pockets and join her in making the building next store a kind of boarding house where people can reside and join in evenings of music and conversation after being fed delicious meals from the chef she hopes to lure back into her employ. Interest piqued, they join forces to make the building over from what seems to have been a brothel in years past but whose recent history remains a mystery. It turns out they are not the only ones interested in the building. Captain Tristin Hardy and his men have been tracking smuggling operations of a Blue Rock gang. This gang has been smuggling a number of items, among them cigars, but their trail lingers around that same building and at the same time runs to the ground at Derring’s death. Determined to solve this mystery, Hardy finds himself renting a room at the building formerly known as The Palace of Rogues. However, the newly refurbished Grand Palace on the Thames requires that he follow a number of rules including mandatory nights in pleasant company in the parlor after dinner and frequent donations to a swear jar. The Grand Palace becomes the residence of an interesting assortment of guests, even the quiet sisters who take to sitting in the darker corners. Though none proves as intriguing to Captain Hardy as Lady Derring and the same could be said for her. Tired of being the gently bred nice girl the idea takes hold in her head to take a lover. Captain Tristan Hardy seems like just the ticket. I loved this book. The dialog, the intrigue. I would have liked to rent a room there myself. And I look forward to her next book in the series which features Angelique and the mystery man whose man of business secured rooms he never came to occupy. I've enjoyed her stories and this sounds like something I would enjoy too - thanks! I loved the relationship between Tristan and Delilah but the friendship that grows between Delilah and Angelique is equally as wonderful. Like Santa, I'm already eagerly anticipating the next book in the series! I used to read a lot of JAL a few years back, but to tell the truth, I got tired of the Pennyroyal books after a long while. I walked away from several books left unread but reading your review for this new book/series has me deciding to come back into her fold. I'm off to put this book on my BTB list. Pennyroyal is a long series and I certainly understand how you might grow tired of it after a while. However, if you haven't read the final book in the series, THE LEGEND OF LYON REDMOND, I highly recommend it. It was my top book of 2015. Do you read contemporary romance? I think Long's Hellcat Canyon series (which was released over the past few years) is exceptional. And fun. So much wonderful humor and heart. Hope you enjoy the new series too! I can understand series burn out. I have an author whose books I adore but there seems to be more and more coming teaching into futures generations if characters. I just can't keep up,lol. But I really think you will enjoy this one. I really liked the slow burn of Tristan and Delilah. They both were very protective of themselves and their hearts. OK - you have done it to me again. This does sound like a book I would love. I like humor and mysteries and great dialog. It has been awhile since I have read a book by Ms Long. I thank you for the terrific review. Take care and if you could start writing reviews which were negative - describing books I would never want to read - I would truly appreciate it. LOL! Believe me, Annette, I know what you mean. My bank account regularly begs me to find books with negative reviews that I DON'T buy! I immensely enjoyed the books I have read of this author. Your review just solidifies my intent to read it this book soon. I really enjoyed it, Lil and obviously, Santa did too. Hope it's a hit for you as well. I love her books and this looks like another winner.